The latest research from Jana shows the big gift for Indonesian and Vietnamese consumers this holiday season is a new Mobile. 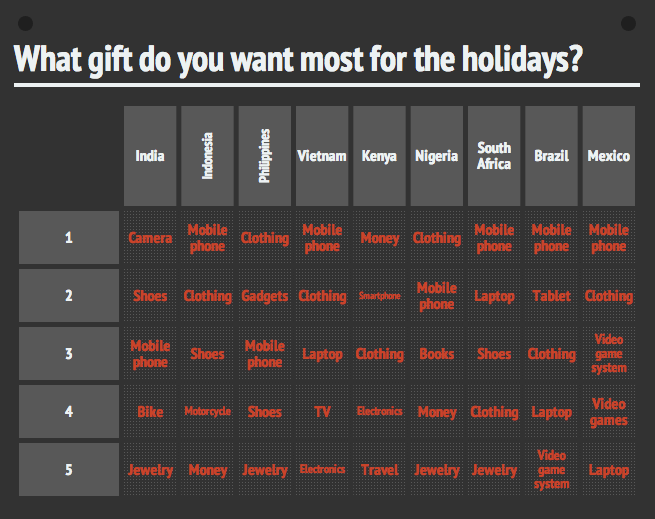 Indians want a camera more than anything, although in all surveyed Asian markets, the Mobile was a top 3 gift item. The study also looks at the impact of ecommerce on holiday shopping, and interestingly over a quarter of respondents will do at least 50% of their holiday shopping online this year. Find out more at the Jana site.